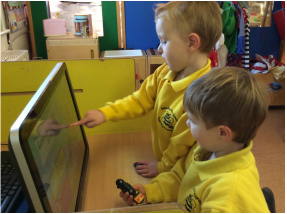 Our large playroom is divided in different areas to reflect the different areas of learning, where equipment is easily accessible for children to use on their own. Play choices change daily and include water, sand, paint, play dough, books, role play, home corner, mark-making, construction, computer, small world play and music. We are fortunate to have a fantastic outdoor play area which we use all year round. The children move freely between indoors and outdoors. ​We believe the outdoor environment is a fantastic resource to enhance children's learning and are extremely lucky to have a beautiful woodland area right on our doorstep. From time to time, we take the children for walks in the woods, where they can safely explore and learn about the nature around us. 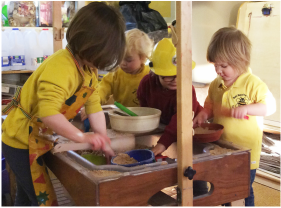 We help our children to experiment with building using different materials and tools. Our children can develop their fine motor skills whilst expressing their ideas and talking about what they've created. 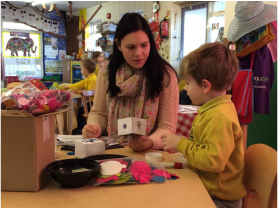 We have a wide range of activities such as painting, drawing, cutting and model-making. 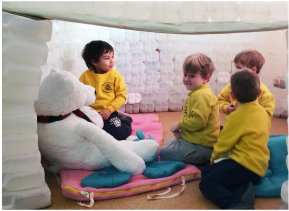 This is a constantly changing space where we create themed play areas such as our winter igloo. 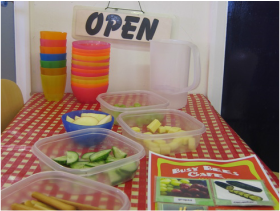 A selection of healthy, nutritious and seasonal snacks and drinks is available every day throughout the morning and afternoon sessions. The children are encouraged to choose from a short menu in our Café. The food we serve is prepared in our kitchen. We received an 'Outstanding' in our recent hygiene inspection. Any allergies or dietary requirements are always taken in account. We give our children the opportunity to talk, interact together and act out their own stories. We are committed to making our outdoor environment as rich and diverse as possible, so that our children's learning is extended to their outdoor play all year round. We are very proud of our fantastic grass and playground areas, which are well equipped with ride-on vehicles, a climbing frame, slide, mud kitchen, a digging area and lots of outdoor games. We also have a gardening area where we plant flowers and vegetables and watch them grow. ​The children love having the opportunity to go outside every day, whatever the weather, and we provide wellies and waterproofs.